Harry Price wrote extensively about the young Rumanian girl Eleonore Zugun (or Zungun as it is also spelt) in two of his books. There is a detailed report on the case in his Leaves from a Psychist's Case-Book (Victor Gollancz Ltd., 1933) and he devotes two chapters of the later Poltergeist Over England (Country Life, 1945) to Eleonore's phenomena. Reproduced here are the contents of the chapters from Poltergeist Over England relevant to the Zugun case - they are Chapters XXII 'Poltergeist Mediums', the first part of which (omitted here) covered Anna Rasmussen as well as Eleonore Zugun, and Chapter XXIII 'Poltergeists that Bite'. 1. For the early history of Eleonore, and account of the phenomena, see Der Spuk von Talpa, by Countess Wassilko, Munich, 1926.
pane. The stone was wet (1) and round - similar to those found in the river Seret, a few yards from their cottage. A priest was called. He marked the stone with a cross, and threw it back into the river. Then he returned to the house. A little later, the same stone, recognised by the priest's mark, was flung into the house again. Then her parents became frightened and sent the child to a neighbour's house. The villagers were more and more convinced that Dracu, the Devil, was the cause of all the trouble, especially as the manifestations followed the girl from place to place. They threatened to put her in an asylum. Frightened, the child returned to her parents, and, immediately following her home-coming, large potatoes came from under the bed and fell violently upon her father's shoulders. Her father then resolved to take the child to a priest, and next morning he, together with fourteen other peasants, conducted Eleonore to the old priest of Zamostea, named Macarescu, a bedridden old man of about eighty. Soon after Eleonore had entered his room, an iron vessel, which had before been placed on a stand, suddenly burst into many pieces. Immediately afterwards, an earthen vessel which had been on the hearth, also burst. The splinters were thrown into the court. Scarcely had the people recovered from the shock, when both inner windows broke, and one of the splinters fell into the room. The outside windows remained intact. During these events the old priest, his son, and the school teacher, Teodorescu, were all present. All, startled, ran out of the room. The teacher looking through the window, alone saw a big chest, which stood against the wall, move backwards and forwards, as well as from side to side, of its own volition. Only one young man, Joan Ostafi, had remained in the room. When he saw the chest moving, he stopped it, saying: 'Wait, devil, I see you cannot do it alone, I will help you.' 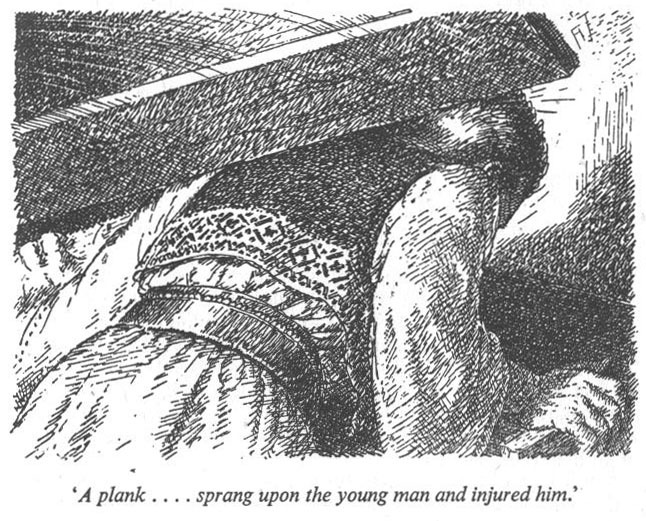 At this very moment, a plank, hidden in a corner, sprang upon the young man and injured him. Then all again entered the room and one of them proposed going on a pilgrimage to St. Johannes at the Convent of Suczava. The name of the saint being pronounced, a stone was thrown against a picture of him that hung on the wall, destroyed the picture, and remained lodged in the wall. Only the teacher was sufficiently courageous to remain in the room. He sat opposite a bench on which was a can of water. Suddenly this can of water was levitated eighteen inches, described a half circle, and came down on the other end of the bench without spilling a single drop of water. The peasants begged the priest to hold a mass, in order to cast out the 'devil' that was supposed to be in possession of Eleonore - as the villagers believed. This ritual was without success and the pilgrimage was accordingly performed, also without any success; on the contrary, the phenomena grew more and more violent and frequent. 1. An identical phenomenon heralded the outbreak of hostilities in the 'Mill on the Eden', p.206. As the pilgrimage was not successful, the girl was sent to the Convent of Gorovei, near Talpa. The most amazing phenomena happened - or were alleged to happen, at Gorovei. The priests said masses for her; she was exorcised; she was examined by psychiatrists; she was experimented with - and on - and she was hypnotised. But the phenomena still occurred. Then the University of Czernowitz became interested, but failed to do anything. Finally the case got into the Press - as was inevitable. ﻿Fritz Grunewald, the well-known Berlin engineer and psychical researcher. He was interested not only in the girl, but in the controversy that was raging in the Press. Certain papers declared that the whole thing was a swindle; others were convinced that Eleonore was mad; while those newspapers which had investigated for themselves, said the phenomena were genuine. However, the girl was declared insane, and was incarcerated in the local asylum - where she was confined, alone, in a dark room - treatment comparable with the witchcraft persecutions of the seventeenth century . With the death of Grunewald, Eleonore was again left to the tender mercies of the superstitious villagers of Talpa, and the Countesg Wassilko-Serecki, (2) a Rumanian lady living in Vienna, decided to rescue her. She, too, was interested in psychical research. Eleonore arrived in Vienna in September, 1925, and at once puzzled the Austrian scientists, especially the physicists. Her phenomena grew stronger and more spectacular. My friend, Professor Hans Thirring, the distinguished physicist of Vienna University, was especially interested and wrote to me about the girl. I had already received Grunewald’s report, (3) so was acquainted with the case. Dr. Thirring invited me to investigate the girl, and arranged for me to give a talk on psychical research at his University. I arrived in Vienna on April 30, 1926, and began my observational periods next day. I found Eleonore installed in the Countess's charming flat in the Josefstadterstrasse and I at once set about arranging a test. I decided to utilise the Countess's bedroom-study for my experiments. This room was divided longitudinally by a match board partition, about six feet high, with an opening at one end for communication between the two divisions. A pair of French windows, leading to a balcony overlooking a quiet wooded garden, provided ample illumination for both study and bedroom. I have already intimated that the apartment was divided into a study and bedroom and these I. minutely examined after I had carefully fastened both doors and windows. A bed, toilet table, chairs, etc. comprised the bedroom furniture; and a low bookcase, filled with books, a couch, a writing table, chairs, etc. were placed in conventional positions in the study portion of the room. 1. Curiously, I had an appointment in Berlin with Grunewald, who was going to write a preface to a German edition of one of my books. I called at his flat early in July, 1925, and because I could get no answer, hammered at his door. I little knew that his body lay a few inches from me, on the other side of the door. 2. See her "Early History and Phenomena of Eleonore Zugun', British Journal of Psychical Research, Jan.-Feb., 1927. 3. Psychische Studien, Munich, July, 1925. ﻿were watching my precautionary measures. I had already met the Countess on a previous visit to Vienna. I found Eleonore to be an intelligent, well-developed, bright girl with a sunny disposition. She was then nearly thirteen years old. Though physically strong and healthy, she was 'young' mentally. In many ways, she was more like a girl of eight: her shyness; her extreme fondness for simple toys; her simple games and childish ways. But she could read and write well and was even something of an artist. She was five feet tall and weighed 123 pounds. The Countess and I seated ourselves on the couch and watched Eleonore playing with a toy that fascinated her: a spring gun that projected a celluloid ping-pong ball, which was caught in a sort of conical wire basket that was attached to the gun. Suddenly, as we watched, the ball came to pieces, its component halves falling at our feet. The girl ran to the Countess and asked her to mend it. She jumped up, and so did I. As I watched my hostess examining the join, a steel stiletto with handle, used for opening letters, the whole about ten inches long, shot across the room from behind me and fell against the closed door. I instantly turned round and a minute investigation revealed nothing - and no one - that could have projected the stiletto, which was normally kept on the writing table behind us, against the wall farthest from where we stood. Let me say at once that no one in that room, and certainly not Eleonore, could have thrown the paper-knife. We were at least ten feet from the table; I had both Eleonore and the Countess in full view. Eleonore had one half of the ball in her right hand, and the gun in her left; the Countess had the other half of the ball in her hand, and I was actually watching both my hostess and the child; the stiletto came from behind and to the right of us, and I was between the missile and the door. It was a brilliant introductory phenomenon. 1. Leaves from a Psychist's Case-Book, by Harry Price, London, 1933.
gradual expansion of a viscous substance, or similar contrivances: things difficult to hide and easy to find in this sunlit room. We also witnessed another type of phenomenon - stigmata - but a description of these I am leaving for another chapter. Well, I was much impressed with what I had seen. So impressed in fact, that I decided to import both the 'Poltergeist girl' and benefactress - and, I hoped, the phenomena - to London in an attempt to witness again the wonders I had seen in Vienna. The girl and the Countess accepted my invitation with joy. Countess Wassilko and Eleonore arrived in London on September 30, 1926. A number of phenomena, I was told, had been witnessed on the long journey from Vienna. They were delighted to be in London. Eleonore looked even more robust than when I saw her in the previous spring; and, although she was now turned thirteen years of age, there was no sign of the menses. The first alleged phenomenon that occurred was that a silver finger-ring, suddenly missed from Eleonore's dressing-table on the first night of their arrival, tumbled from nowhere as the girl was playing with a Cairn terrier that used to visit my Kensington laboratory. ﻿found every letter in its place on the notice-board and asked to see the remaining stock, if any. It appears that six specimens of each letter were supplied with the set sold with the notice-board, which had arrived only the previous day. Upon checking the unused letters, we found that one was missing - the letter L. Only three persons in existence knew where the unused letters were kept. One of these was out, and the other two - the typist and a youth employed in the library were actually in the room (the library), when the letter appeared in the laboratory. The unused letters were in the box secured by two fasteners, and kept in a closed cupboard. It was proved absolutely that no one in the Laboratory suite had entered the library for days - the Countess and Eleonore have never been in to this day - and the notice-board and sets of letters had not been in the building twenty-four hours. The Countess was not in the building at the time. Mr. Palmer in his report (1) stated that he saw the letter drop from the ceiling, falling upon my shoulder, and then to the ground. I distinctly saw the letter strike the girl's head and then fall upon the floor. Not being under stringent test conditions, we are not hailing the L incident as a phenomenon. On the other hand, there is not the slightest evidence that anyone was cheating; nor have we yet discovered how it was possible for a person to abstract the letter from the fastened box and closed cupboard in view of the fact that three persons only knew where the letters were kept. None of these was connected with the Laboratory. It has been suggested that because the letter is magnetic it might have had some affinity for the girl, but I think this theory is fantastic. The fact remains, though, that these magnetic letters played a major rôle in the manifestations which occurred during the girl's visit. But how the L found its way from the library to the laboratory - a distance of forty-eight feet - is still a mystery. 1. Daily News, Oct. 1, 1926.
about the room. It was these coins that I went to check and place in their prescribed positions. Four of the coins I placed on the ultra-violet ray cabinet, spaced evenly, five inches apart. The one on the extreme right was a Danish copper 1-øre piece. On the lintel of the door leading to cloak-room, I placed four more coins, about six inches apart. The third coin from the left was a brass l-franc piece. I placed other coins in various positions or checked those that were already there. I then returned to my writing in the office. During this checking of the coins Eleonore was playing with her cat in the passage, the whole length of which I could see through the open office door. At exactly 2.30 I heard a coin drop in the séance-room. I looked at Eleonore, who also looked up at the same time. She said 'Dracu!' I rose from my seat, and with Eleonore (who waited for me) entered the séance-room. I at once looked at the coins which I had so recently checked and arranged, and found that the 1-øre piece from the right of row on ultra-violet cabinet, was missing. The others on the lintel of the door had not been touched. After about two minutes Eleonore found the coin not far from the curtained 'cabinet' across corner of room near window. As a matter of fact, we saw the coin simultaneously. While she was stooping down to pick up the Danish 1-øre piece, and I was watching her, the French franc - which two minutes previously I had seen firmly in position on the wide lintel of the door, fell from its place and was discovered to right of gramophone cabinet. It must have rolled - at least, that would be the normal explanation - but I did not hear it roll; I heard merely the sound of the coin (weight, twenty-seven grains) falling. No other person was on the Laboratory floor - no one was nearer than the ground floor, four stories below. ﻿sporadic and spontaneous nature that their repetition at a given time and place becomes impossible. The fall of the franc was the first telekinetic phenomenon of Eleonore's witnessed at the Laboratory, concerning which I was absolutely satisfied. The falling of the coin off a ledge may be a simple movement, but for this movement to take place automatically by mechanical means would require fairly elaborate apparatus which could not be rendered invisible. I could fill many pages with accounts of the phenomena we witnessed, under scientific conditions, during Eleonore's stay in London. (1) Her visit caused the greatest interest among scientists and others who attended many of the observational periods, and those whom I invited included: Dr. R. J. Tillyard, F.R.S., Mr. W. R. Bousfield, F.R.S., Mr. Edward Heron-Allen, F.R.S., Professor William McDougall, F.R.S., Professor Hans Thirring (who travelled specially from Vienna in order to see our experiments), the Hon. Everard Feilding, Professor A. O. Rankine, F.R.S., Dr. Thea. B. Hyslop, late chief of Bethlehem Hospital, the London mental asylum, and many more. If the 'Poltergeist' phenomena were interesting, her stigmata were equally puzzling, and they deserve a chapter to themselves. Eleonore had an idée fixe that Dracu - the Rumanian Devil - used to bite and otherwise maltreat her - an obsession that we tried to eradicate, without success. The painful weals, teethmarks and scarifyings that she experienced were more than a match for our logic. 1. For a full account, with illustrations and plans, see Proceedings of the Nat. Lab. Of Psy. Research, Vol. I, Part 1, London, Jan. 1927.